Biscottis are a great cookie to make and eat morning, afternoon or evening. 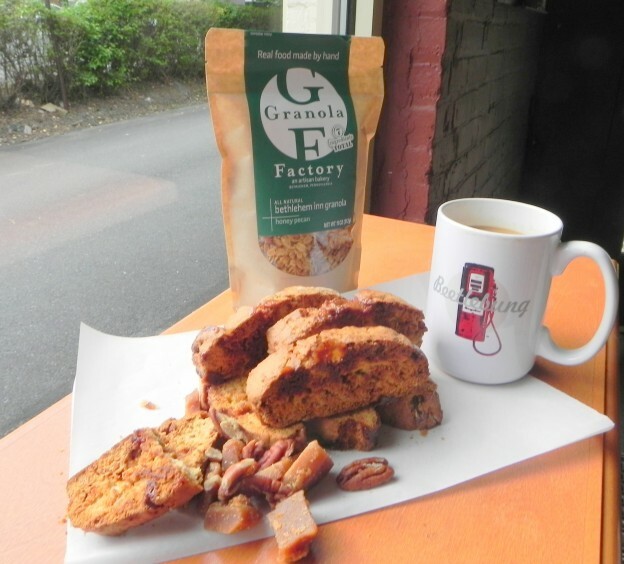 The salted caramel and honey pecan granola gives this biscotti a great sweet and salty flavor. Lightly brush bottom and sides of a 9×13 inch rimmed baking sheet with oil. Line with parchment, leaving a 2-inch overhang on long sides; lightly brush parchment with oil. Bring cream, sugar, butter, and corn syrup to a boil in a large saucepan over high heat, stirring until sugar dissolves. Reduce heat to medium-high; cook, stirring occasionally, until caramel reaches 248 degrees on a candy thermometer (about 15 minutes). Immediately remove caramel from the heat, and stir in salt and vanilla. Pour caramel onto a baking sheet, and let stand, uncovered, at room temperature at least 8 hours and up to 1 day. In a large bowl combine sugar, butter, brandy, and extracts. Beat with electric mixer until very creamy, about 2-3 minutes. Add eggs one at a time to butter/sugar mixture. 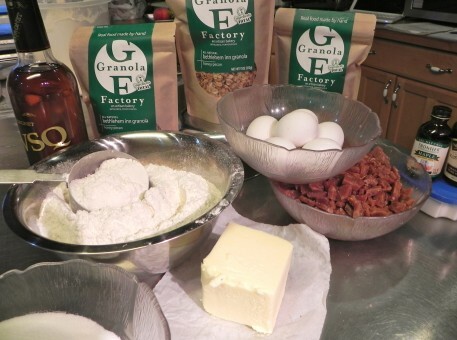 In a medium bowl, combine flour, Granola Factory’s Honey Pecan Granola, salted caramel, baking powder, and salt. Stir with a rubber spatula to combine. Chill dough, covered, for 30 minutes. Preheat oven to 350°F with the rack placed in middle. 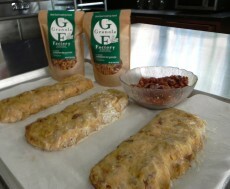 Using lightly floured hands, halve dough and form 2 (16-by 2-inch) loaves on a parchment lined baking sheet. Bake until pale golden, which is about 30 minutes. Carefully transfer loaves to a rack and cool for 15 minutes. Arrange biscotti, with a cut side down, on a clean baking sheet and bake until golden, 20 to 25 minutes. Transfer to rack to cool completely.